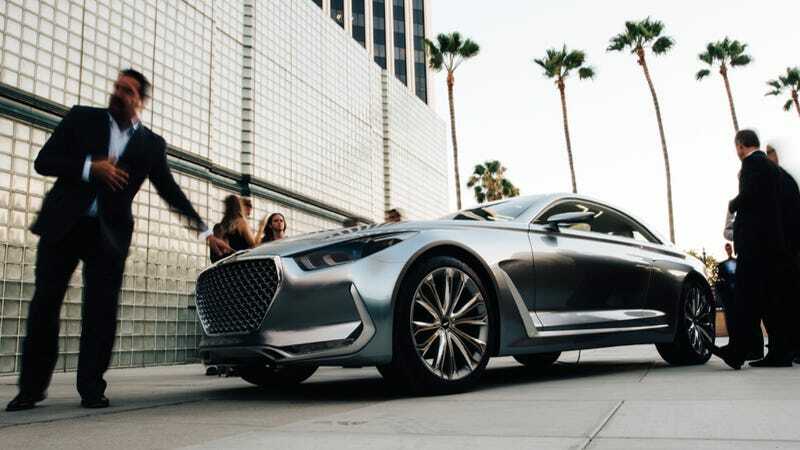 I saw the Hyundai G Concept in the flesh last night, and for something that’s essentially supposed to be the next Hyundai Genesis it was, well, big. I don’t mean “oh this is big,” like in the industry sense, I mean BIG. Imposing. Large. But Hyundai is considering something even huger. Yeah, huger. Is it a word? NOT IMPORTANT. What is important is that things might be about to get interesting for the Korean carmaker. A Hyundai spokesperson at the unveiling of the car last night told me that there’s room above the Equus, Hyundai’s not-quite-a-Mercedes-E-class that everyone was probably a bit weirded out by when it first showed up. Of course, that would mean going toe-to-toe with the Mercedes-Benz S-class, and, well, that’s quite the tall order. The Equus, which by all accounts isn’t a bad car, isn’t exactly lighting the market on fire yet. So for Hyundai to shoot even higher than that, they’re going to have to get it right, with investments in engineering, quality control, materials, and on and on. But! That’s not entirely impossible. As has become the cliche at this point, we must sagely note that Toyota has done it with Lexus, and GM’s managed to engineer quite the turn around for Cadillac. And now for the kicker – neither of those things managed to quite dethrone the German kings, and Cadillac is still, more than ten years after its turn around began, a bit of a work in progress. That being said, the cars might not even wear the Hyundai brand, the spokesperson told me. Thoughts are being bandied about in regards to a spinoff, to separate the higher-model makes from the run-of-the-mill Sonatas and whatnot. We’ve actually already seen that writing on the hood, with the Genesis and the Equus wearing their own plates on the front. Whether or not it becomes a Thing, instead of just a thing, is probably still a few years out.